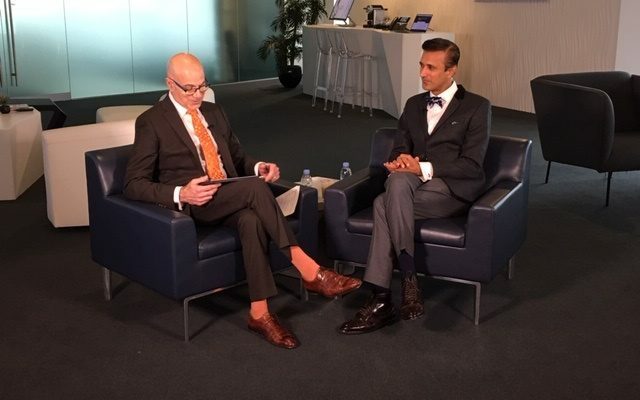 Chetan Dube, the CEO of IPsoft Inc, goes one on one with Anthony to discuss the future of the workforce and how technology will change how we think and work. IPsoft is the largest privately owned artificial intelligence company. Chetan started his company after a question began to haunt him – “Can machines think?” His goal is to have machines come together with carbon forms to create a more efficient planet. IPsoft has already created technology that is changing the way companies interact with their customers. They have created the most human-like robot named Amelia, who is already utilized by some of the biggest corporations in the world. However, new technology comes with fear. Some fear that we may not be able to distinguish carbon life forms from androids. Colleagues in the workforce fear that machines and technology will take their jobs. Leadership fears the cost and risk associated with implementing new technology. Chetan explains how leadership will be redefined in the years to come. The risk of not implementing and utilizing technology is greater than the risk of adapting to the changes technology will bring to the workforce. Technology will change the landscape of the workforce and it is not a matter of if it will change, but when and how it will change. This technological revolution took 1/5th of the time of the first economic evolution. Chetan’s one fear is that the masses will not be ready for the speed of the revolution. It is extremely important for leaders to align their business models with the changes that technology will bring, and to wake up the masses. Leaders need to prepare their workforce to understand that this technology is here to help them. It will open up colleagues’ time to new creative thinking and problem solving, and their roles will be redefined, giving thought back to the people who lost it to task. With the changes that new technology will bring to the workforce, Chetan is hopeful and energized with the thought that the future will be filled with more imaginative and creative thinking. For the first 10 years of the company’s existence, IPsoft’s staff focused all of their efforts on researching and learning as much about the human brain as possible, not even writing a single line of code. Chetan sites current research which states the average human uses their creative brain less than 30% of the day, while 70-80% of every day is pulled down by common chores. He is excited to see what kind of human creativity will be unshackled as technology helps to unlock more time to use our creative brains. Humans are at the top of the food chain because of our brain and the new cortex, which allows us to think creatively. Chetan is confident that as technology evolves, human thinking will also evolve with it. To learn more about Chetan Dube and the IPsoft’s work, visit their website: www.ipsoft.com.